Hello, overall I like your app. I have one issue that I hope you can help me resolve.... since I downloaded the app a few months ago, I am still unable to open the “Breakfast and Brunch” portion to view recipes. Three dots constantly scroll across the section. I have uninstalled and reinstalled the app before. However, I’m still having an issue. Can you please advise on how to correct this problem? Thank you. When I first downloaded app, years ago, it worked great! I saved recipes and found new ones. Now? I can only pull up 5 of my favorites. As for looking for new recipes? I can only find a handful of new recipes that I like. Whoever updated this app should be punished. Please find someone else to fix the app!! Loved this app until this week. Now I can’t open recipes from the internet into the app to cook. I hate cooking from the internet because my iPad goes to sleep. I disliked having to start on the internet....this makes it even worse. I decided to make chocolate chip cookies for my three hungry kids, so I followed the Betty Crocker recipe because I thought it sounded trustworthy. Little did I know that it would soon turn into my worst nightmare. The dough turned out to be awful and the cookies looked like biscuits! And when I tried to write a review on the website, it wouldn't let me! Betty Crocker, you let me down big time! Love the recipes, but can't log in to the app!! I've been using the website for a long time and I've never had a problem logging in. So I downloaded the app awhile back and thought to myself "This is great!" and I never bothered to try logging in since I just log in online when I'm at home. That said, I finally attempted to log in from a friends' house so I could show her a recipe in my favorites. Every time I try to log in, the app takes me to the account creation screen and won't let me log in!! So I tried setting up a new account from the app itself and it won't move past the creation screen. What's the point of having an app you can log in to if you can't log in?? Good app with lots of recipes. My one negative is that when you are viewing a recipe in your "Favorites" and you go back to the previous screen, it takes you back to the top of your list rather than to the spot where you just were. So you have to scroll back down to the spot you were last at. There are tons of yummy recipes to chose from but I saved 100 to my favorites and 50 went missing. I can't find them in the original recipes - where did they go? It used to update automatically every month to reflect the website. Now mine is stuck on December meals and cookies. The month of meals has vanished as a feature. May as well just use the website. Some of my recipes are missing completely from both favorites and cookbook. I can only find them by Googling them. Please bring all of the recipes back! What is going on with this app?? Can’t log on. Can’t favorite recipes. When I try to ❤️a recipe, it wants me to log in. Can’t do that because it says the email and password are invalid. Also, I haven’t been receiving emails for a while now. The last one I received was in February. Tried to find a recipe on the app that I had located on Pinterest but it kept crashing on me and saying no recipe found. But, when I went to Betty Crocker website, BAM, there it is...but not on the app!!! I used to really enjoy this app. I haven't needed to use it in a month or so but when I attempted to log in today it said my password was invalid - fine, a quick reset and we're good. Wrong! I log in with the new password and ALL of my favorites are gone. Extremely upset since I've been collecting recipes my picky family actually likes for several years now. On top of that they're search function has become almost useless. You used to be able to put in one or two key words and yield loads of results. Now you're lucky if returns more than a handful...and don't bother trying to search by the exact recipe title - tried two different recipes (even confirmed online) and the search came back with not found. Like other reviewers have mentioned, don't bother trying to find a true from scratch recipe for most desserts, etc. It's all about starting your base with bisquick rolls and pie crusts, etc. 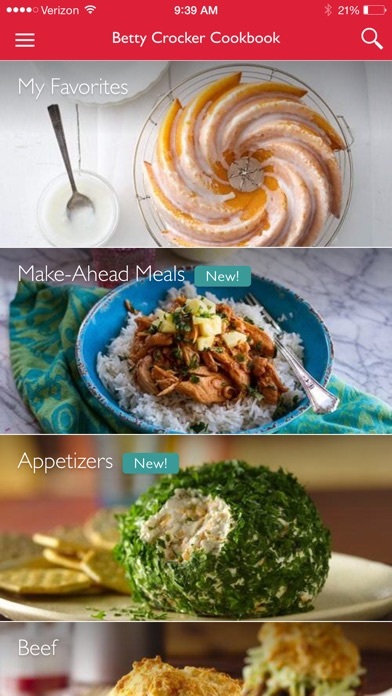 I've found the AllRecipes app to be the best fit for me - great community support and awesome (from scratch) recipes. Was great when I could use it. I can’t log in to save or use any of my saved favorites. Used the forgot password link to reset, checked my mail and clicked the link sent. All it says is redirect. I have tried multiple time over a few months with no luck. I have also sent emails to customer support with no further contact received. The app was great but with the absence of customer support when there is an issue makes me never want to use it again. So much for customer service. Here are other recipe apps I will use for now on. Breaking up with Betty. 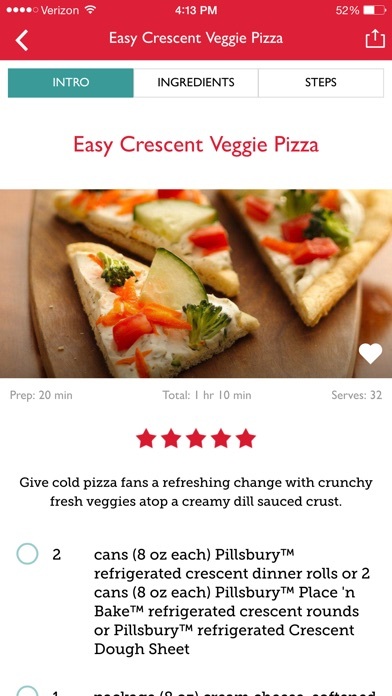 I wanted this app to be like the amazing red checkered cookbook that I pull out all the time. All these recipes call for pre-packaged items. What a disappointment! ɱყ ɠơơɖŋɛʂʂ-ı Ɩơ۷ɛ ɬɧıʂ ą℘℘! ąƖƖ ơʄ ɬɧɛ ཞɛƈı℘ɛʂ ąཞɛ ąɱąʑıŋɠ (۷ɛཞყ ཞıƈɧ) ąŋɖ ɬɧɛཞɛ ąཞɛ ʂơ ɱąŋყ ąŋɖ ąƖƖ ơʄ ɬɧɛɱ ąཞɛ ʄཞɛɛ! ıɬ ıʂ ɬɧɛ ცɛʂɬ ɬɧıŋɠ ɬɧąɬ ɧą℘℘ɛŋɛɖ ɬơ ɱɛ ʂıŋƈɛ ı ɠơɬ ıŋɬơ ƈơơƙıŋɠ. ɬɧıʂ ą℘℘ ɖơɛʂ ŋơɬ ɖɛʂɛཞ۷ɛ ცąɖ ཞɛ۷ıɛῳʂ-℘ɛơ℘Ɩɛ ąཞɛ ɛҳ℘ɛƈɬıŋɠ ɬơơ ɱųƈɧ ʄཞơɱ ą ʄཞɛɛ ą℘℘. ɧąɬɛཞʂ ɠơŋŋą ɧąɬɛ, ცąƙɛཞʂ ɠơŋŋą ცąƙɛ. Also just a note, there's always room to improve. 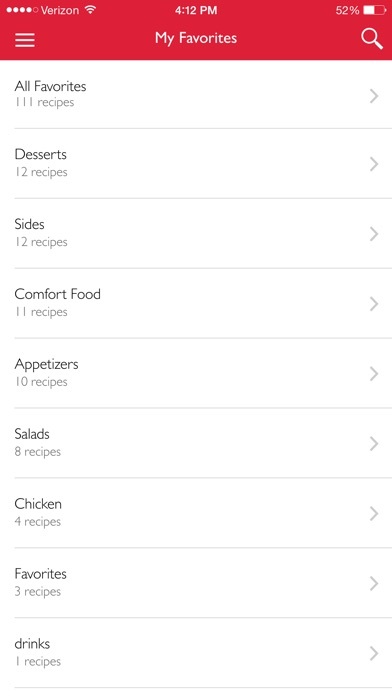 Please make a feature where you can print the recipes directly from the app. I'm sick of having to screenshot them and printing them out as pictures. The app is so useful, but please add a print feature. Please! You can't find recipes because the search function is useless. 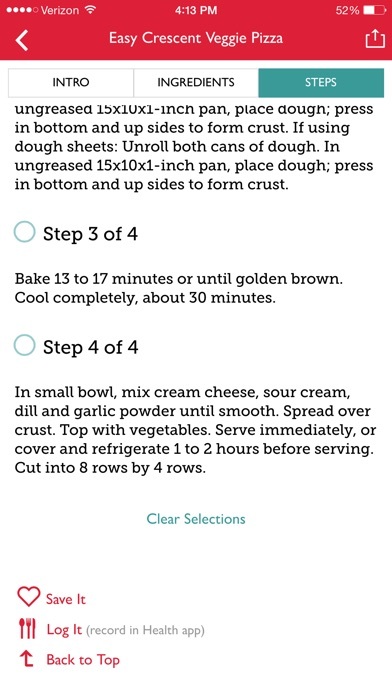 I love this cookbook app so much. Very recommended!! I should've believed the reviews. Pretty basic. I'll stick with the old school cookbook and search the web when I want something different. Pretty much a waste of memory. Great addition to the book! This app is a great companion to the classical cookbook. I've found some great recipes that I don't have in my book. Like the cook, they range from simple to complex, but are always tasty. I love all of the recipes I have tried and I like the “shortcut” recipes using cake and cookie mixes, etc. I get great ideas. However, this app is a disaster. Whoever is in charge of this at Betty Crocker needs to be replaced. Right now when you click on Easter recipes it pulls up a strange combination of Christmas and Valentine’s Day recipes. I have saved recipes to my favorites, but when I search for them, they don’t pull up at all. I can however find them if I scroll through 1000 of my favorites. Another annoying feature is when I’m scrolling through my favorites and I click on a recipe, if I go back to my list, it returns back to the top of the list not where I left off. And the recipes aren’t in the same order as they were before. Seriously Betty Crocker, app design app is not that difficult. You don’t need a degree from MIT to do this, a community college certificate is sufficient. Don’t mean to be harsh, but I hope whoever reads this feels shame for their poor job performance. If you don’t want to put the resources into an app, please get rid of it or at least warm people you are no longer maintaining it. Reviewed a number of recipes that I would NEVER make - Bisquick seems to be the star of the show. Or processed sugar cookie dough to make muffin tops!! BC used to be a great resource for home cooking - not any longer. Real food recipes would be nice. A pancake recipe WITHOUT bisquick? This app is not helpful to me if the recipes all contain branded products that are affiliated with Betty Crocker in some way. For example, Bisquick doesn't belong in a true "made from scratch" recipe. If this app can't be true to the spirit of the original scratch recipes, then really, it's just being used as a shill for the brands that are "highlighted". What a disappointment. Deleted app. Will look elsewhere. This app used to be great to use. But it hasn’t updated in forever. I still see the same thing every time I open it. Some of the recipes I get in my email I can’t find on the app later. Sad to see it being ignored by the developer. 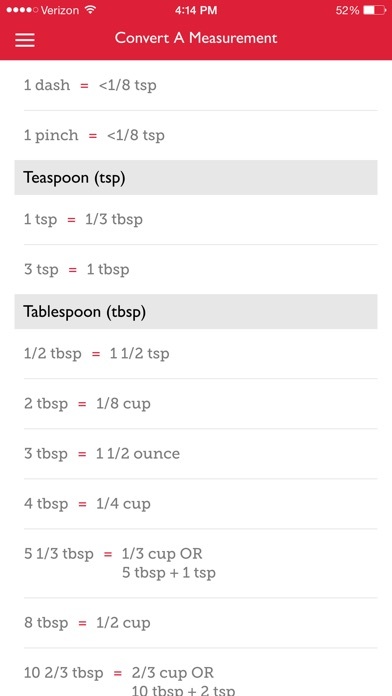 The app doesn't let you print the recipe. I'd rather use printer paper in the kitchen than my iPad. The app. is slow and all the recipes use Bisquick. This app has potential. The recipes are good and many are from my Betty Crocker cookbook that I've had since 1978, but as others have said, many newer recipes have shortcuts and are not made from scratch. Home cooks today do need these shortcuts to get dinner on the table quicker after working all day. The downfall of the app for me is not being able to print from the app and having to go to the website to print a recipe. The other issue is once you save a recipe to a category , it can't be moved to a different category if you decide to change it. The search feature needs some work as it does not return expected results. I would rate the app higher if these issues were addressed. On the website I found a recipe named easy chicken with rice casserole that I liked. So I got the app but found that recipe wasn't listed. I searched it and nothing. So I clicked on it from the website and it opened up in the app, great right. So then I tried to add to favorites. I clicked the heart then clicked save. Went to favorites to check and nothing. Did it three times. Why doesn't the app allow me to save a recipe that's on the website AND shows up in the app? This is basically “how to doll up a Betty Crocker cake mix/Bisquick”. If I had a mix, I wouldn’t NEED a cookbook. Deleting. I downloaded this app several years ago. I was really working on expanding my cooking abilities and it helped tremendously. I ❤️ed some great recipes, learned a lot, and was pleased that it included all the classic recipes from my mother, grandmother, and mother-in-law's old BC cookbooks. I had to delete the app for awhile, and when I re-downloaded it for my daughter, who is learning to cook and bake herself, it's completely different. It won't log me in, and when it does, all my ❤️s are gone. Searching for a recipe now is basically looking through ads for General Mills branded foodstuffs disguised as recipes, and all the classics seem to be gone. I tried to look up a basic buttercream frosting recipe, with no success. I Googled it, only to be taken to…THE BETTY CROCKER WEBSITE. Seriously? If I can access what I want through my browser, why bother having this gigantic, memory-eating app on my phone at all? I (generously) gave it 2⭐️ because hey, there are recipes, and if you want to look gourmet without using Pinterest, then you'll love this app. I used to love their app. Cons: The search is terrible. You type in cupcakes and it shows you cookies and breakfast items? I can search for recipes that I know are on the full website, and they do not appear in the app. It's better to just use the real website. Pros: it has pretty pictures. Couldn't even get a simple breakfast recipe without running into the instruction to use BISQUIK MIX. Total disappointment. My APP is half downloaded post most recent update. It will not finish. I can not open / use the APP. I've tried to deleted it - just so I could download the APP again. Can't delete the APP either. Also on a iPad Air. Every time I try to use my favorites you give me server code 401. And I can't even login to look at recipes it would be a great app if the server would not crash the recipes are super easy and very nutritional but I can't even login and look at my favorites. I would give it more stars for the recipes but I'm only giving it two because of the server crash in. I added something to my favorites but favorites won't open it! Also, I can search for an item on the website for not in this poorly developed app. If you can't can a good app, then don't make an app. What a waste of my time. Thanks for fixing the app. It now works great again (in landscape mode)!! 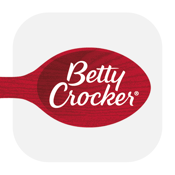 Betty Crocker has so many recipes and yet you can't find any of them in this app. Most of the recipes require you to buy Bisquick, Suddenly Salad or a cookie mix. I just searched for a sugar cookie recipe and didn't find a single recipe for actual sugar cookies, just recipes that use the sugar cookie baking mix. Plus it hasn't been updated since July? If you want from scratch recipes, I'd recommend just buying the big red book. I love this app. I'm a new home cool and love Betty Crocker's cookbooks. This is a perfect, easy way to get recipes and tips. Now I do not have to worry about dirtying my cookbooks! I love this app and use it often - only thing I wish it had was a way for you to make notes on recipes on items you may have changed, added, or did different and other things you would like to make note of. I go to Betty Crocker’s recipes because I want easy to make American style comfort foods that I can make from scratch. I am disappointed that so many recipes start with asking me to buy Betty Crocker SuperMoist cake mixes or Bisquick. It is so difficult to find “from scratch” recipes, even though they do exist in this app. My biggest frustration with this app is that I may use my computer to look for recipes on the Betty Crocker website and then favorite them. But, when I use this app, only 60% of those recipes show up. Here is an example: go to the Betty Crocker website and look up “best chocolate cake with fudge frosting”. Now go to the app; that recipe doesn’t exist! Why is that?